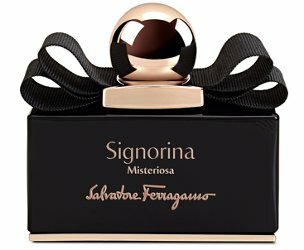 Salvatore Ferragamo will launch Signorina Misteriosa, a new fruity oriental flanker to 2012's Signorina, in February. The fragrance is meant to be mysterious and unpredictable; the CEO of Ferragamo Parfums noted that women are "multifaceted and polyhedral". Signorina Misteriosa was developed by perfumers Sophie Labbé and Nicolas Beaulieu. The notes include blackberry, neroli, orange blossom, tuberose, patchouli and black vanilla mousse. Ferragamo Signorina Misteriosa will be in Eau de Parfum. Update: Signorina Misteriosa will be sold in 30, 50 and 100 ml. Polyhedral ! Now I am curious about the rest of the copy… this could be Prix Eau Faux material! I liked the original Signiorina… but wasnt crazy about it.. Let’s see if this has more oomph or what. Will report back if I see it! That’s not in the press materials, but he said it at the press event and WWD repeated it in their article. It is so delicious that it quite literally gave me chills up my spine. Or should have said — no idea if it’s in the press materials, which I’ve never seen! I did not find a definition of polyhedral. However, I suspect it means polyhedron- like. A polyhedron is simply a three-dimensional solid which consists of a collection of polygons, usually joined at their edges. The word derives from the Greek poly (many) plus the Indo-European hedron (seat). If the head of Ferragamo thinks women are three dimensional polyhedrons, then I doubt their clothes can fit on anyone. Polyhedral deserves a medal. I sure wonder what they find unpredictable about a fruitchouli with vanilla! I feel like I could’ve predicted that one in my sleep. I’ll have to try this and check! Black bottle laced with gold yet NO oud or pepper!? Are we finally out of the storm? Dare to dream. But I expect we’ll see lots more oud in the new year. I guess if we’re polyhedral, we are multi-faceted in the most literal way you can be. Yes, what a pleonasm, good point. Yes! no time for subtleties at Ferragamo!